Sir Elton John's name may be attached to this 1991 Ferrari 512 Testarossa, but he hardly ever used it. Just 2,100 miles on the clock gives it significant investment potential. It's up for auction in COYS Spring Classics auction in London, next week. The 512 Testarossa, bought new by Sir Elton, is one of 40 cars going under the hammer at the Royal Horticultural Society, Lindley Hall, on Tuesday March 12th. The Ferrari only covered a 1812 miles in Elton's ownership but very impoertantly was always subject to an annual service. It's well known that Elton drove all 28 of the cars in his collection on a regular basis, and gave rides to many other dignitaries and celebrities before they were auctioned off by Christie's in 2001. 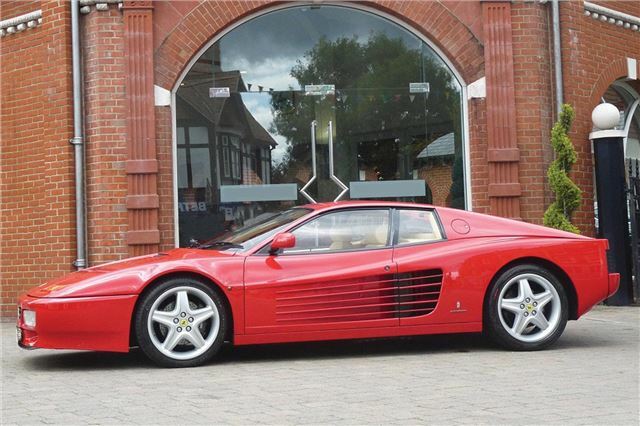 The 512 on offer here sold for £98,000 at the time and went to its current owner. Having still covered only 2,100 miles from new, this 512 TR is reported to be in pristine condition. Finished in Rosso Corsa with complementary beige interior, it comes with a complete service history and a letter of ownership authenticity from Sir Elton. Most recently this year it has been serviced at Meridian Ferrari where it has had its cambelts replaced. This Ferrari is estimated at £90,000- £110,000. Chris Routledge MD of COYS said: "This must be the lowest mileage 512 TR available, with exceptional ownership provenance. With Ferrari prices continuing to rise, this car offers the opportunity for a real blue chip investment." David Cronenberg and is estimated at £180,000 to £210,000. sensible investment for the future. Another important collectors car going under the hammer includes a rare and exclusive 1974 Jaguar E-Type Commemorative, one of fifty special roadsters built to mark the end of the model's production in 1974. This iconic Jaguar, with only 25,950 miles from new, is estimated at £115,000 to £135,000 and would be an unrepeatable opportunity to become a member of the most exclusive E-type club. Additionally, in the year of the 100th anniversary of Aston Martin, the auction will feature a 1975 Aston Martin V8 estimated at £55,000 to £65,000. The car is finished in metallic blue with a blue hide interior and has been held in pristine, original and un-molested condition throughout. It even comes with an extensive service history and MoT certificates dating back to 1984. COYS Spring Classics auction will also include a general mix of pre and post war sports and touring cars. Further details will be published on the website - www.coys.co.uk.